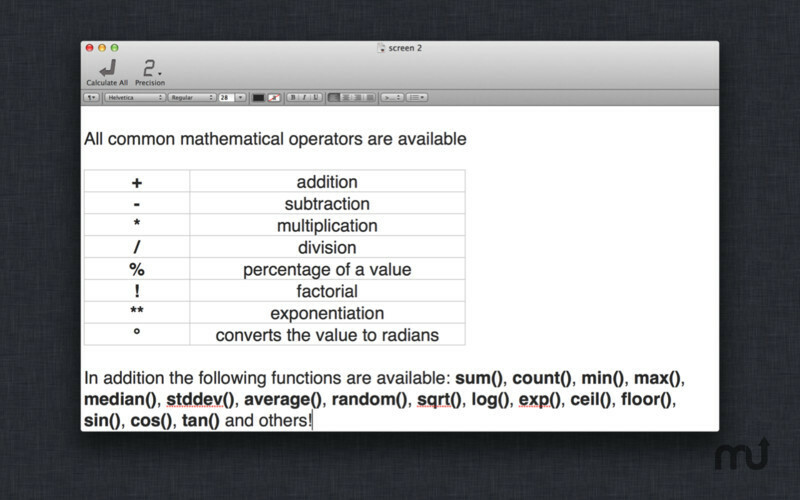 Simple text editor with calculation capabilities. Is there a better alternative to Expresso? Is Expresso really the best app in Productivity category? Will Expresso work good on macOS 10.13.4? 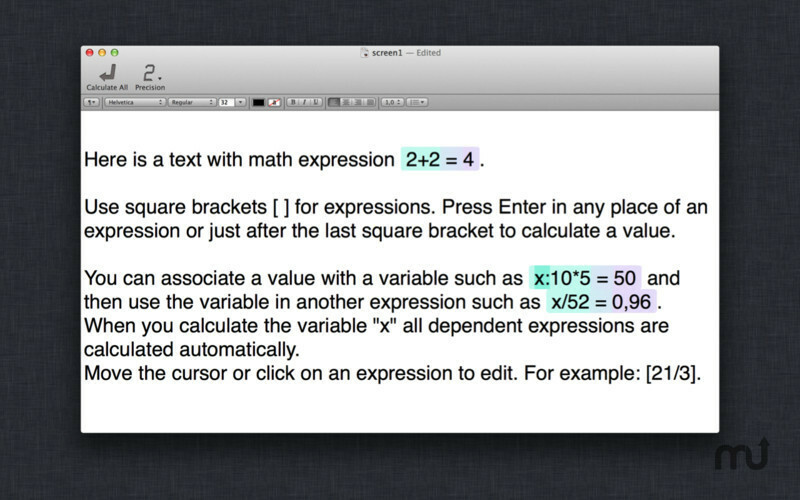 Expresso is like the old, familiar TextEdit with calculation capabilities. 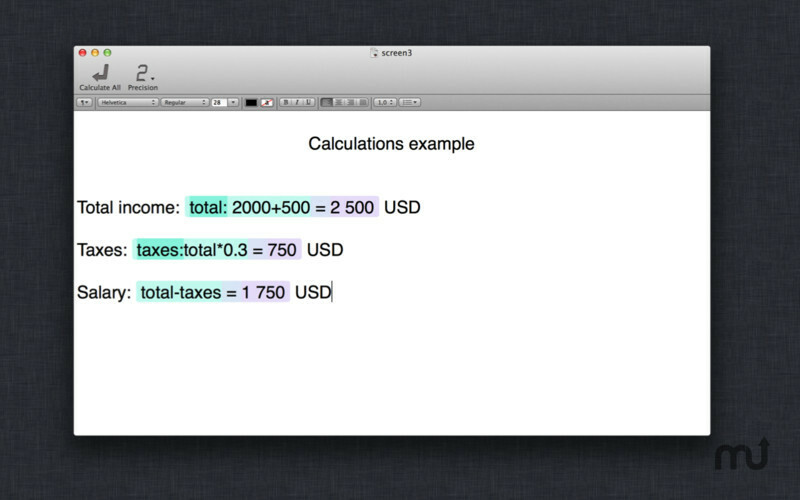 Organize calculations inside tables like in spreadsheets. Expresso needs a review. Be the first to review this app and get the discussion started! Expresso needs a rating. Be the first to rate this app and get the discussion started! Expresso has common math operators and functions available: (+, -, *, /, %, !, **) in addition, to the following functions: sum(), count(), min(), max(), median(), stddev(), average(), random(), sqrt(), log(), exp(), ceil(), floor(), sin(), cos(), tan() and others! Please see the help page for more details. Use square brackets [ ] for expressions. For example: [2+2]. Use variables in your expressions. For example: [10*x]. Input the name of a variable before the expression followed by ":". For example: [x:2+2], variable x will have the value 4. Calculations can be saved in RTF format. You can associate a value with a variable such as [x:10*5] and then use the variable in another expression such as [x/52]. When you calculate the variable "x" all dependent expressions are calculated automatically. ariable "x" all dependent expressions are calculated automatically. ability to hide/show an expression and show only variable and value.